The Breeders’ Cup TV & Torrey Pines Golf Experience Sweepstakes is open only to legal United States residents residing in the fifty (50) United States and the District of Columbia and residents of Canada (excluding Quebec) who are eighteen (18) years of age or older. 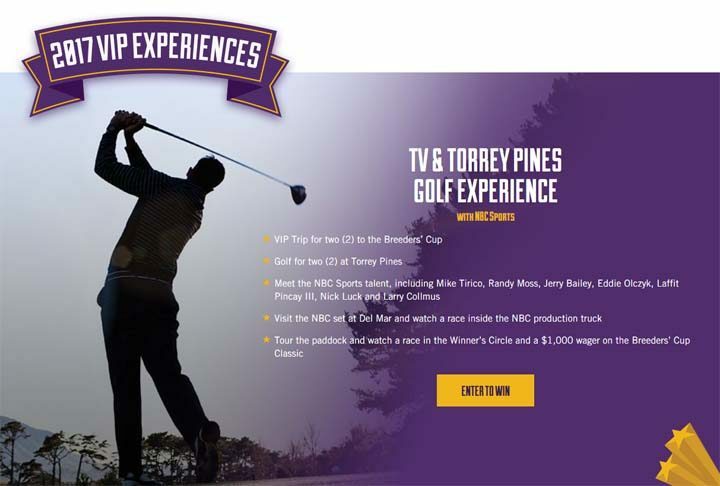 The Breeders’ Cup TV & Torrey Pines Golf Experience Sweepstakes ends on October 9 at 11:59:59 p.m. ET. One (1) Prize is available. The Prize consists of a VIP Trip for the Prize winner and one (1) guest to the Breeders’ Cup at Del Mar racetrack in California. Prize includes: a) round-trip economy class airfare for the winner and one (1) guest from a major airport near winner’s residence to the San Diego, CA area; b) three (3) nights hotel accommodations; c) a round of golf for two (2) at Torrey Pines Golf Course on Thursday; d) the opportunity to meet the NBC Sports talent, including Mike Tirico, Randy Moss, Jerry Bailey, Eddie Olczyk and Larry Collmus and visit the NBC set at Del Mar racetrack; e) two (2) VIP Hospitality passes to the Breeders’ Cup for Friday and Saturday including transportation to/from Del Mar racetrack and hotel; e) the opportunity to tour the paddock and watch a race in the Winner’s Circle; f) the opportunity to watch a race inside the NBC production truck with the show producer and director; g) the opportunity to watch a race inside the track announcer booth as Larry Collmus calls the race; and h) $1,000 wager on Breeders’ Cup Classic. The approximate retail value of the Prize is $3,977 USD/$5,356.42 CAD.